The expectation of faster inflation may prompt the Fed to raise its benchmark interest rate from close to zero. (Bloomberg) — A bond-market gauge of the U.S.’s inflation outlook over the next five years rose to the highest in more than two months as rising oil prices during the past week eased concerns that the threat of deflation is spreading. Ten-year Treasuries rose on Wednesday, paring their drop the previous day when yields jumped the most in 14 months. Tuesday’s gain in rates came as oil rallied and Greece promised to pay its debt, sapping demand for the relative safety of government bonds. An outlook for faster inflation may remove a hurdle for the Federal Reserve as it moves toward raising its benchmark interest rate from close to zero. “The Fed expects the recent fall in inflation to be short-lived, keeping it on course for a tightening in mid-2015,” said Nick Stamenkovic, a fixed-income strategist at broker RIA Capital Markets Ltd. in Edinburgh. “Global factors look set to underpin Treasuries near-term” but the strengthening U.S. economy “should prompt a reassessment of the medium-term rate outlook, exerting modest upward pressure on 10-year yields in the second half of 2015,” he said. The five-year break-even rate, or the difference between yields on five-year notes and comparable Treasury Inflation-Protected Securities, was little changed at 1.51 percentage point, the most since Nov. 24, based on closing price data. The gauge, which measures expectations for the average rise in consumer prices during the life of the debt, has jumped from the 1.07 percentage point reached Jan. 6, the lowest since September 2009. The yield on 10-year Treasuries fell one basis point, or 0.01 percentage point, to 1.78 percent, as of 7:20 a.m. in New York, according to Bloomberg Bond Trader data. The price of the 2.25 percent security due in November 2024 rose 1/8, or $1.25 per $1,000 face amount, to 104 7/32. The yield jumped 13 basis points on Tuesday, the biggest increase since November 2013. Investors anticipate global consumer prices will rise at an average pace of 1.22 percent a year, according to Bank of America data. The figure has climbed from 0.99 in January, which was the lowest level since 2010. 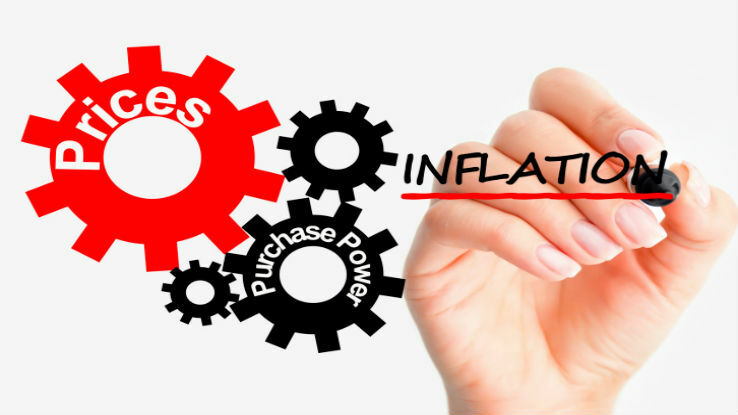 The outlook for inflation is following oil prices. Brent crude futures traded in London, a global benchmark, have risen 17 percent to $56.69 a barrel since Jan. 28. They plunged 48 percent last year. The Fed policy committee, meeting last week, described the U.S. economic expansion as “solid,” while cautioning that inflation could decline further “in the near term.” Futures contacts indicate there’s a 66 percent chance the Fed will boost its benchmark to at least 0.5 percent by December, according to data compiled by Bloomberg. Fed Bank of St. Louis President James Bullard said Tuesday that U.S. central bankers should drop their pledge to be “patient” on raising interest rates, giving them flexibility to push borrowing costs higher. Bullard, who spoke in Newark, Delaware, does not vote on monetary policy in 2015.